Founder’s Day in India | Walk with us! With three formation houses and three parishes it brings quite a crowd together. 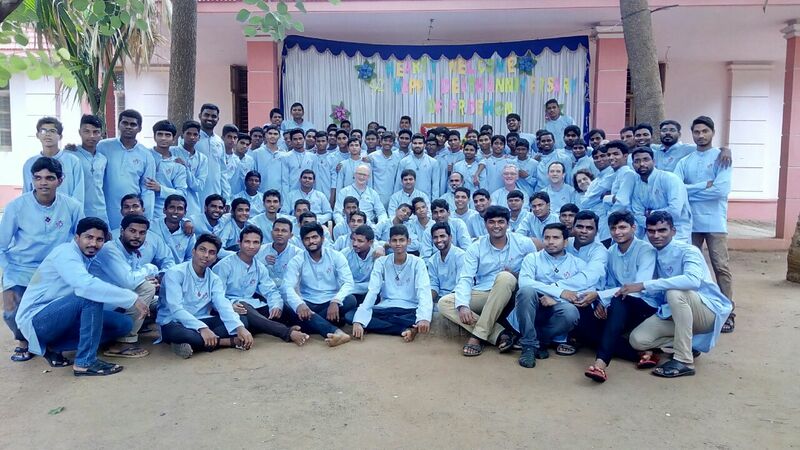 It was CDN’s turn to host the gathering this year but with the large number of minor seminarians (41) from Dehon Prema Nilayam the decision was made to hold it at DPN. We did bring from CDN our cooks John and Rekha to help with feeding the large crowd. Last year some of our CDN brothers had to take public transportation since we only have our truck and van to cart people around in. Due to a late train bound for Eluru the brothers did not get back to CDN until around 4:00 am last year. I’m not sure if that was the motivating force but Fr. Micahel Augustine, scj, our rector, borrowed a van from our former Telugu teacher and a car from our own Br. Meghanandha Chakravarthi Bandanadham’s, scj (3rd year) family and with that we were able to accommodate our entire community. Our Saturday began with Eucharistic Adoration and the presentation of our Dehonian Crosses to the 15 new students from Dehon Prema Nilayam (DPN) followed by the blessing of new juppas (shirts) for all in attendance. These were made to measure by the ladies of Sacred Heart parish sewing center in Vempadu. I was asked to bless the crosses and distribute them as well as bless the juppas. I used the opportunity to remind the new students that while they are at the beginning stage of their formation process it would go by quickly, just ask our fourth-year theologians! I also reminded all present that we are responsible for living and promoting the charism of our founder. After Adoration, the juppas were distributed to everyone so that we could take a group photo. While I did not take a head count I think we had over a 100 in attendance. In addition to Adoration and Mass there were lots of sports activities: basketball, volleyball, cricket and soccer. At night a number of individual indoor games were played such as table tennis and chess. The next day started with a quiz between the three communities of Dehon Prema Nilayam (DPN), Sacred Heart Ashram (SHA or Novitiate) and Christu Dehon Nivas (CDN) on the life of Fr. Dehon. It was won by the novitiate brothers (SHA).